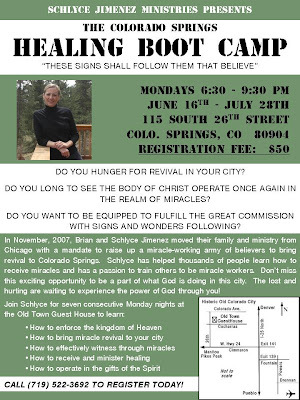 Here's the flyer for the upcoming Healing Bootcamp in Colo. Springs (You can click on it for a larger view). We've finalized the location and it's time to register. Call (719) 522-3692 for more information. It's going to be a glorious time! I was looking out bathroom window the other day praying when I heard these words in my spirit, "The winds of the Spirit are blowing. The winds are change are blowing. Can you feel it?" 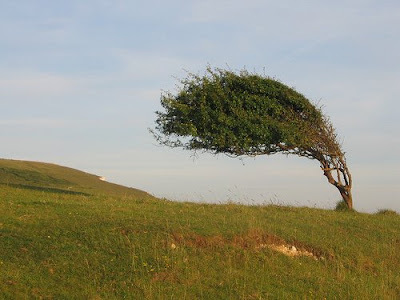 I then noticed that the wind was actually blowing outside my window but not all of the trees were moving. Some were moving with the wind while others seemed not to be affected at all. It was though some of the trees didn't even feel the wind. Then I heard these words, "So it is with My Body. Some are sensitive to the winds of change while other are oblivious to My movement. Some people are not open to My promptings and others simply refuse to yeild. However, the winds of My Spirit are blowing. The winds of change are blowing. I am calling My people into deeper levels of consecration. I am calling My people to press into My grace and allow Me to transform the areas of their life that have been obstacles to progress. My grace is sufficient and made perfect in weakness. So press in My daughter and receive My grace. The winds of change are blowing. Move with them and see my power transform your life. It's time for change to breakforth. It's time for every hindrance, habit and stronghold that has hindered your progress to die. Yield my daughter. Obey my daughter and watch the walls come down."